It will open the tab with info at the top-left corner of the screen, just like info table that is drawn every time you select an object, maybe with option of more detailed info, for example procedurally generated description like in Mass Effect. I love this improvement! I hope you plan to make this description field(s) also readable from the custom .sc files? :-). This will make recording videos in spacecraft mode much more pleasant. I'm really thrilled that you took my post on the atmospheres into play, SpaceEngineer! I started to make built-in wiki system. So far, it only works with the planets. Information about the planet is divided into 4 pages - general, physical properties, orbital properties and atmosphere. I also started doing supporting of the database that will store information about the discoverer of the planet, its description and the name given to it by the discoverer. Wiki supports localization, that is, names and descriptions can be given in a language that is currently used in the engine. I.e. 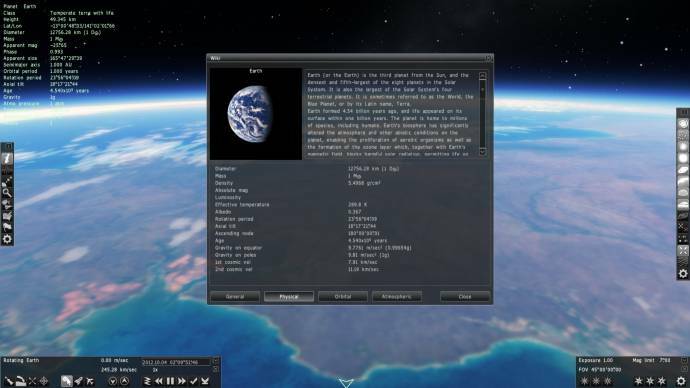 in the database you can enter the information and the names of all the Solar system planets and named stars in German/French/etc, thus obtaining a full localized SpaceEngine. The first example - the Earth. The name of the planet in the upper left corner may be in your local language (on Russian forum I post the same images with Russian GUI and Russian name of our planet). The name may be taken from the database, so no modifying of the scrips required. Description is taken from Wikipedia. - Complete the system by supporting for all other types of objects - stars, galaxies, and so on (including ships). - Supporting for export and import of the database, so that users can share their databases already in the next version, not waiting for network supporting. 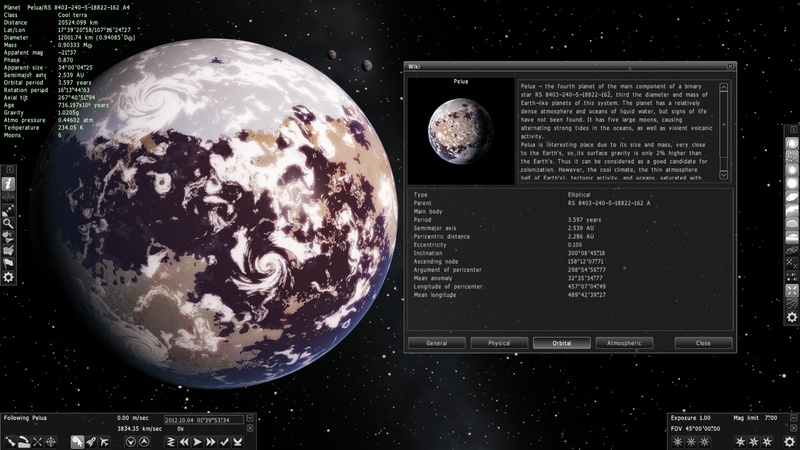 - Ability to view information about several planets simultaneously - for a visual comparison of the sizes, masses and other parameters, with the ability to sort the table by any row. - Supporting for different measure units, i.e. possibility to switch parsecs to light years, kilograms to the masses of the Moon, etc. Actually, I'll keep working on it - it may give SpaceEngineer ideas to improve the in game one. Really nice, actually, SE. The first step to a Nocits-like system? I started to make built-in wiki system. This is the most beautiful thing I've ever seen Thank you so much, this is a dream-come-true for creating fictional universes in the engine. Also, the whole in-game wiki page with additional information for the object definetly looks and sounds cool. That wiki system is going to make community catalogs so much better. Nice job. Not to mention the additional information will make it easier to simulate an interesting or favorite system in Universe Sandbox. This will boost the educational capacities, feed user's curiosity and add the possibility to personalise the game a lot.. Unchaining the imagination of the user . Great feature ! Will there be spellcheck, though? I'm serious, grammar is everything. Also, if a planet has life on it, how much detail should we put into describing its biosphere and any sentient life it has on it? Wow, that is amazing! I love the wiki, as well as the possibility to name procedural planets and switching to different units (I hope you won't just allow parsecs and light years on interstellar distances, but also Peta/Exa/Zetta/Yottametres). Do you need any help writing entries for catalog objects?